Preamble: Area Wide Emergency Net – W4NVU – Dade Radio Club of Miami Inc.
(Name and Call) Miami-Dade Emergency Net Control. Is this frequency in use? My call is (Your Call) and my name is (Your Name) I am your net control for this evening. 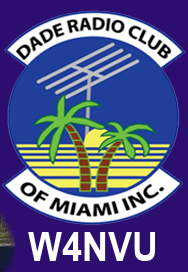 This net is affiliated with the Dade Radio Club. Membership in any club, group, or association is not required to participate in this or any of our nets this evening. The zone nets are as follows. The Coral Gables Zone Net meets tonight on 147.150 with an up 600 shift from 1900 until 1930. The Simplex Net meets tonight on 146.520 from 1900 until 1930. The Cutler Bay Net meets tonight on 146.865 with a down 600 shift and a PL of 94.8 from 1900 until 1930. In the event of failure of the repeater, please switch to the output frequency and operate in simplex. At this time we would like to thank all stations that checked in to this net, also the repeater trustee for allowing the use of their equipment. This is (Your Call). This net is now closed and the frequency is returned to regular amateur radio use. Please stand by for the main net on 146.700 with a down 600 shift and a PL of 156.7 (Your Call) CLEAR.